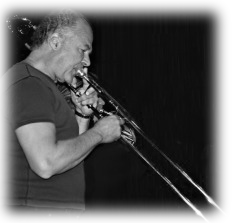 Born in Toronto, Canada, trombonist Russ Little was raised on the island of Jamaica for the first few years of his life before moving back to Canada to attend Malvern Collegiate Institute and the University of Toronto where he attained (in 1966) his honours degree in the Humanities, with special emphasis on History and English. It was during his time at Malvern Collegiate that he was taught trombone (and inspired by) the legendary teacher-trombonist George M. McRae. and featured soloist and later, with the Count Basie Orchestra, he filled a similar role. While touring with these famed jazz orchestras, he found time to become an original member of Canada’s famed Rock Orchestra, “Lighthouse”, a band with which he continues to perform. For fans of classic rock, “Lighthouse” hits include such monsters as “Sunny Days”, “One Fine Morning”, and “Hats Off To the Stranger”. 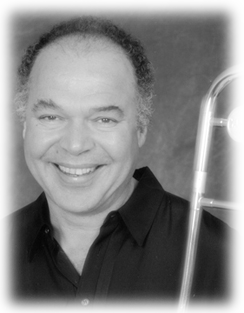 Through the early ’70’s, Russ Little performed in the world famous “Boss Brass”, while pursuing a very successful career as conductor/composer/arranger for the CBC, CTV and Global television networks in Canada. He was also constantly busy writing and conducting for NBC, ABC, General Motors, NFL Football and the famed SCTV comedy series in which he worked closely for many years with John Candy, Eugene Levy and Martin Short. A consistently busy session-musician throughout his career, Russ decided that after a lifetime spent performing on other people’s CD’s, it was time to create his own. “Snapshot” was the first result of that decision. His second album “Footwork” debuted in 2006 to critical acclaim and worldwide sales. His third album, “On the Shoulders Of Giants” was released in the Spring of 2008 and has been received with great interest, praise and excitement by musicians, critics and fans, alike. In the early Spring of 2011 Russ Little released his 4th album, “Slow Burn” to world-wide acclaim for what has been described as its “effortless ease of virtuosity” and “its vast range of appeal to all jazz fans and musicians”. Copyright © 2019 RussLittle.com. All rights reserved.